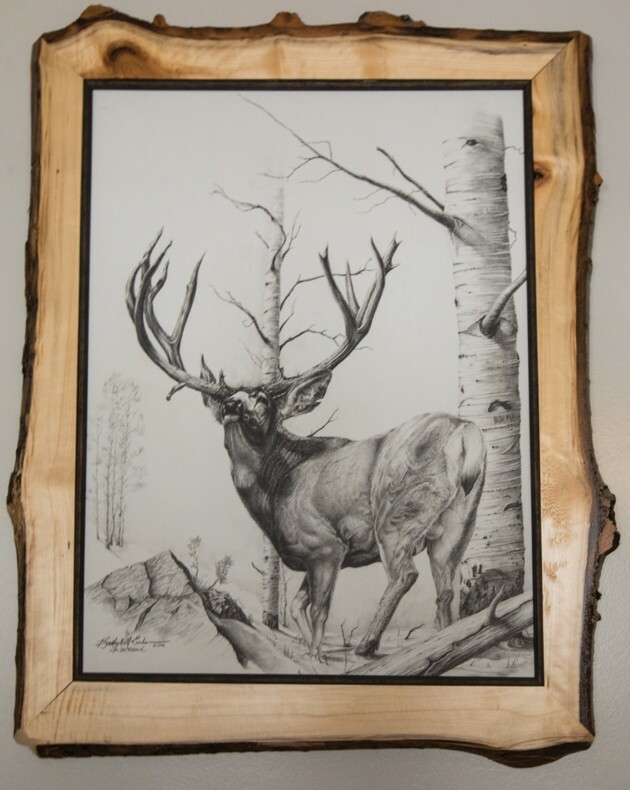 Local artist Brett McEachern works on his detailed drawings in his Tooele home. Brett McEachern uses various types of pencils with hard or soft leads for his artwork. A flock of geese rise from a warm spring. A rush of avian calls trumpet into the misty, wintry backdrop, tinted with the oranges of sunrise. Brett McEachern remembers this scene — the birds, the sunlight, the colors — that he viewed through 6-year-old eyes. “I watched those birds lift up out of the fog, and I was just in awe,” said McEachern, 50, of Tooele. Not only did he sense the drive to express that scene, but he stood in other outdoor settings awed by the beauty of both nature and the animals. From those experiences, he knew he must develop his talent as a wildlife artist. “I drew geese the very first,” McEachern said. “Still draw them.” Geese are his favorite animal. Even at age 4, McEachern understood he had a unique gift when his mother thought he traced instead of drew cartoons. 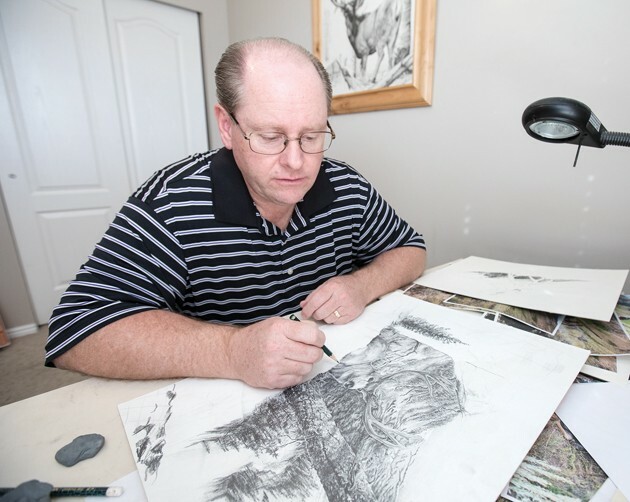 As a teen at Tooele High School, art teacher Don Gibby recognized his talent. Gibby encouraged McEachern to produce his own projects instead of follow the art curriculum. At Weber State, McEachern double majored in psychology and visual communications. His art professors scrutinized his work. Some criticized it as too detailed and realistic — with no abstraction. However, McEachern knew his personal style was about realism and detail. In college, he chose visual communications because he wanted to understand how a career in illustration would work for him. He didn’t like the deadlines and customer demands, though. And illustration didn’t allow him the space to pursue his personal style of study and detail. After working 18 years at the Department of Workforce Services, McEachern began teaching Business at Tooele Technical College. He sees teaching as his other gift. He would love to combine his two loves — art and teaching. People beg him to do it, he said. McEachern loves to teach kids. 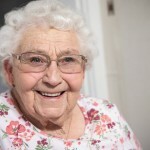 He said he thinks it might be that he especially loves the level at which a student is at, more than the age. The level he loves the most is when students’ interest has just sparked. Family members, including his wife, Kris Holt, and their five sons, said McEachern could make a big impact developing local artists. “I am probably a better teacher than I am an artist,” McEachern said. 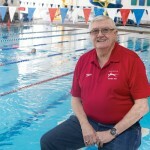 However, currently he has no studio or venue in Tooele. But he feels more support for the arts in Tooele County could solve that issue and benefit the county in other ways. He said Deseret Peak is “crazy good” because the cliff faces respond to seasonal changes in light and weather, particularly snow. Its image constantly changes, but depictions of it are few. Currently, McEachern draws after work. In addition to commissioned pieces, he also creates his personal, original pieces. 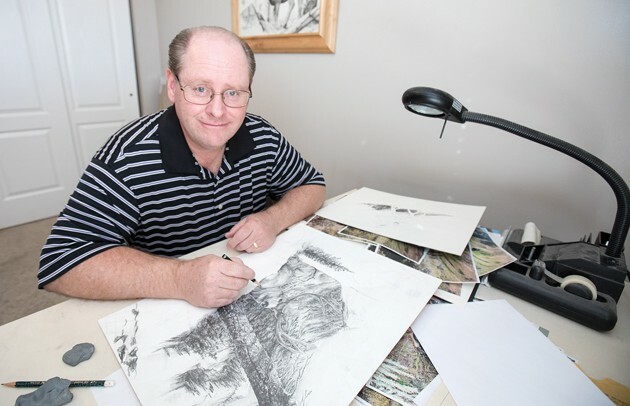 McEachern draws most of his work for patrons — the people who pay for art — who commission him to draw wildlife scenes. Mostly, people want to use art to express their love for a pet or animal, he said. A good portion of his commissioned pieces are the patrons’ canine friends. “They love their dogs,” McEachern said. Often the death or illness of a pet motivates their owner to commission the art. People usually bring him a photo. Then, if possible, McEachern likes to go spend time with the animal and get to know them. Sometimes, McEachern’s only image of the pet is a small photo where details are obscure. He struggles through this situation. “To be honest with you, I pray before I draw, because I know that He’s the master,” McEachern said. Prayer helps him become a vehicle for something beyond his abilities, he said. This allows him to stretch beyond what his current level is and helps him to improve. He said as he works, he seeks to capture the emotion and beauty the animal brought into the patron’s lives. For commissioned originals, McEachern charges about $2 per square inch. The pricing allows the customer to choose a size they want that also fits their budget. For un-commissioned art, he said he usually gives the originals away. However, he mass produces prints of all his art to sell. He sells his prints through his website omountainart.com, and at expos and venues like Sportsman’s Warehouse. It is difficult for an artist to profit unless he sells his own work. If there are three people between the point of sale, the profit is nothing, McEachern said. He feels marketing is the biggest challenge for most artists pursuing a career in art. 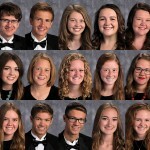 McEachern gathers subject matter for his art from many sources. He works from photographs for commissioned pieces. 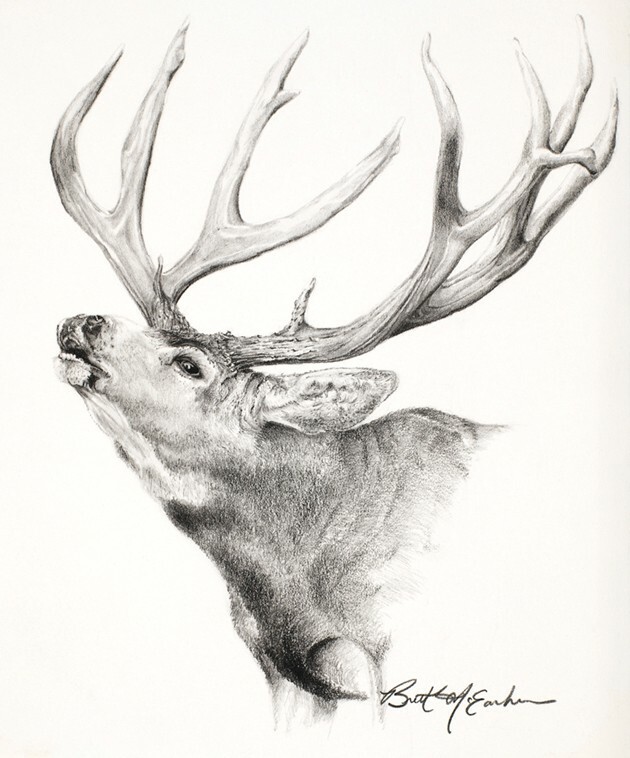 However, for his original pieces, he understands animal anatomy well enough to take bits and pieces from five or six photographs and supply the missing details. “If you take something just from your head, it’s a cliché,” said McEachern. 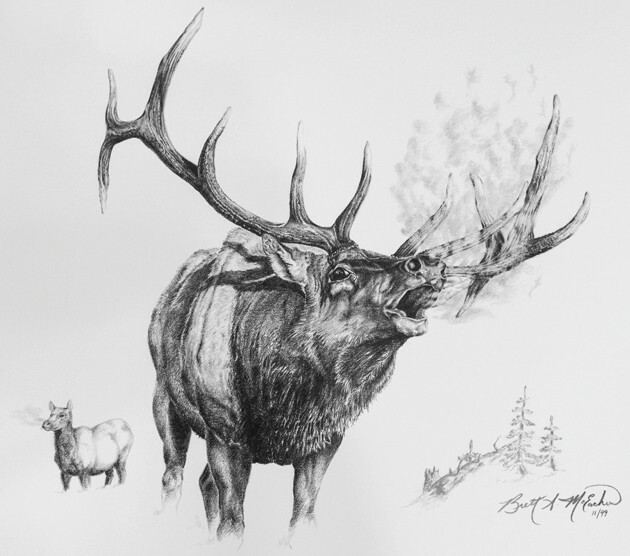 McEachern works in black and white, and often uses five different pencils with harder and softer leads on archival illustration board. “I love to work with just the simplest tool. If I can create something with contrast and texture, and all that it needs with only one pencil, that’s really cool,” McEachern said. Though McEachern works in black and white, he also loves color, though it intimidates him. He feels his slight color blindness makes his colors too bright. He wants to produce a duck stamp of a mallard, which the U.S. Fish and Wildlife Service issues annually in color. Mostly people collect the stamp, he said, but the government also requires the stamp on hunting licenses. For this project, McEachern wants to study with a master oil painter, which he feels will help him overcome his issues with color blindness. He wants to use oils because it is the most forgiving color medium. McEachern works on one project at a time. Because of his attention to detail, often his drawings can take him a couple of years to finish. Currently, he’s working on a drawing for a friend. But, his next project, which is a drawing of a cougar, really excites him. For the cougar piece, he will use a photograph taken by his son’s friend. The cougar lies in a tree with snow falling on him, he said. The photo has texture and contrast from pine needles and snow. Cougars and wolves are very popular subjects in the art market, he added. When McEachern talks to his clients and others about his subject matter, often the people begin to understand the depth of his knowledge, born of decades of artistic study. McEachern learned that fur has both direction and pattern and does not grow randomly. He can name every type of feather on a bird. He talks about feathers in terms of cover, hackle, shaft, pattern and cracks. But when he talks about Canadian geese, he becomes most excited. “I’ve seen some amazing things with those birds,” said McEachern. He loves their sound, the communication between them, their loyalty to their spouse, the reflection of colors of their environment in their feathers, and their adaptability to man-made and natural conditions. 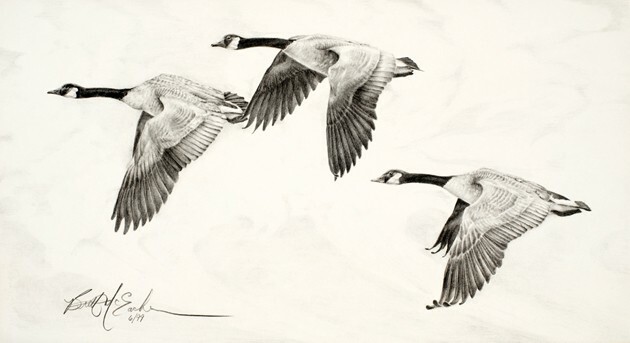 Through the detailed feathers in his art, McEachern can explain the Canadian Geese migration of over a thousand miles. The migration leaves them in “horrific” condition. The high altitude winds crack their feathers. Geese spend weeks grooming and repairing feathers in a recovery process from the migration. They spend most of their time preening — running each feather through their bills preparing for flight, McEachern said. “I mostly study subject matter, not other artists,” said McEachern. McEachern claims artists become more intimate with things the more they draw. Their knowledge expands and they come to know their subject well. He loves sharing his knowledge with those who view his artwork. Geese were the means by which McEachern heard his call to art 44 years ago. That call has helped him further develop a lifetime love for that trumpeting bird, as well as the broader study of wildlife. 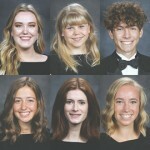 Like the geese, who painstakingly preen each feather, McEachern will continue to hone his talent, almost one feather at a time, as he seeks a greater expression of a gift he feels God entrusted him to share.